I returned to Fukuoka 26 June, thirteen days before the official end of the retreat. I'll explain why in a future post, but for now I thought I'd start with a bit of background. 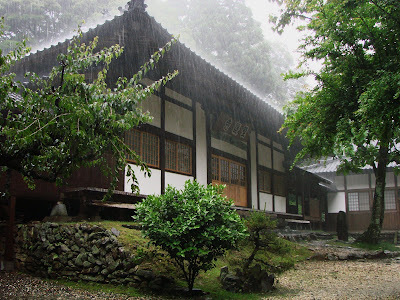 We were there for an ango (literally, “peaceful dwelling”), the traditional rainy season retreat for monastics, a three month period of study, work and meditation. Shogoji's international ango has been shortened to forty days to accommodate the busy schedule of foreigners. Participants are accepted as full members and are expected to participate as if ordained. Most of us arrived with experience of temple services and ceremonies, including those from the Anchorage (Alaska) Zen Community, where our leader for the ango, Koun Franz, is resident priest, as well as from Zen centers in the US midwest and Pacific northwest, and from South America. I believe I was the only who had to learn it all from scratch. Our first ten days were set aside as a training period, during which time we learned how to live in the temple, from waking to sleeping and everything in between. We also began studying to take on temple roles, learning how to ring bells, beat drums, chant, and move about during services and ceremonies. There was a series of lectures on the practicalities of sitting zazen – preferred temperature and lighting, size specifications for cushions, how to fold your legs and hold your hands, how to get to and from the cushion, how to do walking zazen between bouts of sitting – in addition to another explicating the daily schedule of the monastic. Besides learning the three daily services (morning, noon, and evening), we also rehearsed for a number of special ceremonies, such as the official opening of the ango, our first entrance into the sodo (where we would sleep and sit zazen), a special ceremony for one of the foreigners who would begin the process of full ordination at our ango, and a robe-taking ceremony for myself, in which I would be conferred with a rakusu, a bib-like robe, as well as a dharma name. (If you'd like to see a bit of the rakusu ceremony as performed at Shogoji, video from a previous ango has been posted here and here).